Custom Signs and Labels are Easy at ComplianceSigns.com. 3. Add to your cart. It’s that easy to design, preview and order your own custom signs and labels from ComplianceSigns.com. We’ll be glad to design custom safety signs, No Parking signs, street signs, engraved signs - even braille signs to meet your specific needs. Just contact us with your specs (see below) and we’ll design the sign / label for you as we process your order. ComplianceSigns.com has diverse manufacturing capabilities for your custom sign and label needs. 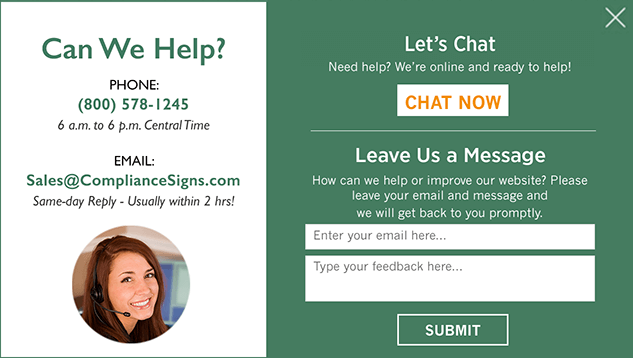 If our online Custom Sign Generators don't meet your needs, please contact our office to discuss your requirements and receive a custom product quote. Signs and labels are available in English, Spanish and bilingual formats with a wide range of size and material options. Don't see the sign you need? Contact us to discuss your needs.